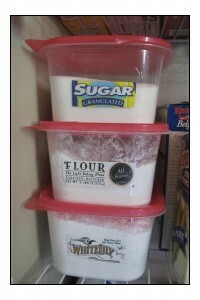 How do you store your flour and sugar? I’m not a big fan of the containers many use and leave out on their counters. Most of the kitchens I’ve had have had limited counter space, and I haven’t been willing to sacrifice any of it for staples that can go in the pantry. Growing up (sorry Mom!) mom just kept the flour and sugar in the pantry in their original bags. There are a couple of problems with this. 1. They take up more room than they have to because they don’t stack. 2. They are susceptible to vermin. 3. They are horribly messy when trying to scoop out a cup of flour from a bag that is 2/3 empty. Containers for my pantry staples – it has made cooking with them so much easier! This is something I love. Lovely idea! You’ll have to show us pictures of your “finished” product! That’s a great idea! Maybe if others send me pictures, I’ll do a series of update pictures! Thanks – I need to post updated pictures, ’cause my pantry rocks now!